RR7 Chauvet fragment ニューヨーク 51の絵文字が荒く刻まれている、12cmの文字板。ヤシの木製か? ^ 「通常の炭素年代法で得られた結果は [...] 80 ±40 BP で、2-シグマ修正による年代は(95%の可能性)、Cal AD 1680からCal AD 1740の間(Cal BP 270から200)、Cal AD 1800から1930 (Cal BP 150から20)、 そして AD 1950から1960 (Cal BP 0 から 0)であった; 実際、この文字板は1871年に収集されたものであるため、それより後の測定年代は誤りである。」"
^ Dans toutes les cases on trouve des tablettes de bois ou des bâtons couverts de plusieurs espèces de caractères hiéroglyphiques: ce sont des figures d'animaux inconnues dans l'île, que les indigènes tracent au moyen de pierres tranchantes. Chaque figure a son nom; mais le peu de cas qu'ils font de ces tablettes m'incline à penser que ces caractères, restes d'une écriture primitive, sont pour eux maintenant un usage qu'ils conservent sans en chercher le sens. Bahn, Paul (1996). “Cracking the Easter Island code”. New Scientist 150 (2034): 36–39. http://www.newscientist.com/article/mg15020344.300-cracking-the-easter-island-code.html. Barthel, Thomas S (1958). Grundlagen zur Entzifferung der Osterinselschrift (Bases for the Decipherment of the Easter Island Script). Hamburg: Cram, de Gruyter. ———— (June 1958). “The 'Talking Boards' of Easter Island”. サイエンティフィック・アメリカン 198: 61–68. ———— (1959). “Neues zur Osterinselschrift (News on the Easter Island Script)”. Zeitschrift für Ethnologie 84: 161–172. ———— (1971). Pre-contact Writing in Oceania. Current Trends in Linguistics. 8. Den Haag, Paris: Mouton. pp. 1165–1186. Buck, Peter H. (1938). Vikings of the Pacific. Chicago: シカゴ大学出版局. Carroll, Alan (1892). “The Easter Island inscriptions, and the translation and interpretation of them”. Journal of the Polynesian Society 1: 103–106, 233–252. Comrie, Bernard; Stephen Matthews; Maria Polinsky (1996). The Atlas of Languages. London: Quarto. Cooke, George H (1899). “Te Pito te Henua, known as Rapa Nui, commonly called Easter Island”. Report of the United States National Museum for 1897. Washington: 合衆国政府印刷局. pp. 689–723. Dederen, François; Steven Roger Fischer (1993). “Traditional Production of the Rapanui Tablets”. In Fischer. Easter Island Studies: Contributions to the History of Rapanui in Memory of William T. Mulloy. Oxbow Monograph. 32. Oxford: Oxbow Books. Englert, Sebastian (1970). Island at the Center of the World. edited and translated by William Mulloy. New York: チャールズ・スクリブナーズ・サンズ. ———— (2002) . Legends of Easter Island. translation by Ben LeFort and Pilar Pacheco of Leyendas de Isla de Pascua (textos bilingües) [Santiago de Chile: Ediciones de la Universidad de Chile]. Easter Island: Father Sebastian Englert Anthropological Museum. Flenley, John R.; Paul G. Bahn (1992). Easter Island, Earth Island. London: Thames & Hudson. Lee, Georgia (1992). The Rock Art of Easter Island: Symbols of Power, Prayers to the Gods. Los Angeles: UCLA Institute of Archaeology Publications. Macri, Martha J. (1996) . 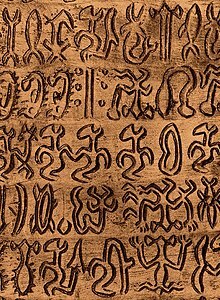 “RongoRongo of Easter Island”. In Daniels and Bright. The World's Writing Systems. New York, Oxford: Oxford University Press. pp. 183–188. Métraux, Alfred (1938). “Two Easter Island Tablets in the Bernice P. Bishop Museum”. Man (London: Royal Anthropological Institute of Great Britain and Ireland) 38 (1): 1–4. doi:10.2307/2789179. ———— (1940). “Ethnology of Easter Island”. Bernice P. Bishop Museum Bulletin (Honolulu: バーニス・P・ビショップ博物館出版部) 160. McLaughlin, Shawn (2004). 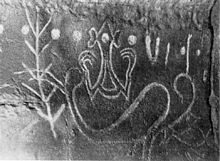 “Rongorongo and the Rock Art of Easter Island”. Rapa Nui Journal 18: 87–94. ———— (2005). “The Rongorongo Tablets from Easter Island: Botanical Identification and 14C Dating”. Archaeology in Oceania 40 (3): 115–119. 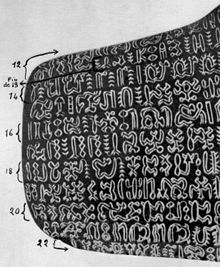 http://legendarysurfers.com/blog/2006/05/rongorongo-tablets.html. ———— (2007). “Botanical Identification of the Wood of the Large Kohau Rongorongo Tablet of St Petersburg”. Rapa Nui Journal 21 (1): 7–10. Pozdniakov, Konstantin; Igor Pozdniakov (2007). “Rapanui Writing and the Rapanui Language: Preliminary Results of a Statistical Analysis”. Forum for Anthropology and Culture 3: 3–36. オリジナルの2008年6月25日時点によるアーカイブ。. https://web.archive.org/web/20080625101918/http://pozdniakov.free.fr/16%20Easter%20Island%20english.pdf. Routledge, Katherine (1919). The Mystery of Easter Island: The story of an expedition. London and Aylesbury: Hazell, Watson and Viney. http://www.archive.org/details/TheMysteryOfEasterIsland. Skjølsvold, Arne (1994). “Archaeological Investigations at Anakena, Easter Island”. In Arne Skjølsvold. Archaeological Investigations at Anakena, Easter Island. The Kon Tiki Museum Occasional Papers. 3. Oslo: Kon-Tiki Museum. pp. 5–120.